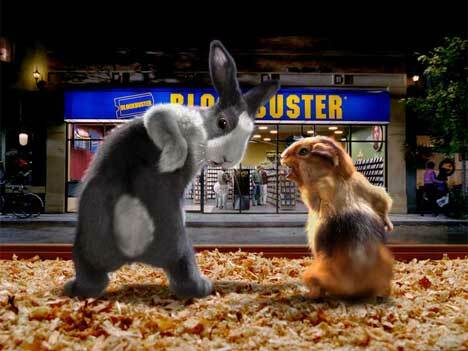 Blockbuster Entertainment resurrected its animal advertising campaign in the Super Bowl XLI with Carl Zampadigomma the rabbit and Ray Paffutelli the guinea pig (popularly referred to as a hamster) interacting with a yet-to-be-named mouse. In “Kung Fu” Ray is inspired by Blockbuster’s stock of Kung Fu movies to leap about with a carrot. When he crosses the line and whacks Carl over the head it’s time to call in reinforcements – Ninja Mice. Click on the image below to play the video in Vimeo. Also screened in 2002 were Rabbit Ears and Tricks. The four Carl and Ray spots in 2003 were Tunnel, Goodbye, Freedom Pass Out, and Hair in Curlers. Scott Parks, vice president of advertising at Blockbuster, and Jim Noticarnicola executive vice president chief marketing officer, worked with Don Fibich, creative director at Doner Advertising, Southfield, Michigan, and agency producer Josh Reynolds. Filming was directed by Steve “Spaz” Williams and produced by Clint Goldman for Complete Pandemonium. Visual effects were done at Tippett Studio, a company that formed its commercial division around the Carl & Ray campaign in 2001. The animals were brought to life by a team under the leadership of visual effects supervisors Scott Souter and Frank Petzold. Characters were first drawn in 2D, scuplted in clay, digitised, and then manipulated in the computer to enable it to receive fur. Tippett Studio won Clio awards in 2002 for computer animation with Kung Fu (gold), Gotta Dance (bronze) and Prima Donna (bronze), and visual effects with Kung Fu (bronze). Carl is voiced by James Woods. Ray is voiced by Jim Belushi.